A pained expression is etched on the face of Mary Jane Decio, who has just arrived in the badly affected city of Ormoc in Leyte Province in the central Philippines from nearby Cebu City. She is anxious to know the fate of her six young children, five days after Typhoon Haiyan, one of the strongest storms ever recorded, hit the country. "I am really scared. I haven't heard anything about them," she said, explaining that she had been working as a housekeeper in Cebu City (the Philippines second city) and had not seen her children for three months. Estranged from her husband for some time, the 38-year-old was reluctant to leave her children in the care of her aging mother-in-law, but has always believed working for their sustenance was paramount. But after seeing the devastation unleashed by the category five storm on TV on 8 November, Decio quickly left her job, boarded a fast-craft sea vessel from Cebu and headed to the affected area. She is one of thousands of Filipinos who have yet to hear news of their loved ones, particularly those living in remote areas not yet accessible and largely out of reach of rescue and relief efforts. As of 13 November, thousands remain missing, many of whom are believed dead, according to the authorities, with many bodies of victims not yet recovered. Lack of communication and limited family tracing services have made the search for loved ones difficult, with many families turning to social media and other tools for help. According to Google People Finder, 67,900 people have registered to look for loved ones or provide information on someone who was found. A government website listing those reported missing, injured, and deceased is also receiving a lot of hits. Meanwhile, others have taken to more rudimentary methods. Randy Santos brought with him to Ormoc a family picture of his brother Rolando Santos, his wife Sherly and their two children Samuel, 12 and Jeddaida, eight, to help in the search. "We have been trying to call him in Tacloban City, which was badly hit by the typhoon but to no avail," he said. Tacloban, a two-hour ride from Ormoc is one of the areas worst affected by the typhoon, with an initial death toll of over 100 people - a figure now feared to be in the thousands. Those who sought shelter in evacuation centres soon found themselves in trouble after a three-metre high wall of seawater swept inland. Military airbases in Cebu and Manila are being inundated with requests to hitch a ride on C130 planes to Tacloban City to find loved ones. The scale of devastation is enormous, and local officials in Ormoc concede that their preparedness measures (evacuating over 10,000 residents living in coastal and low-lying areas) were insufficient. Ormoc City Councillor Ruben Capahi said the typhoon was so "extraordinary" that it destroyed 95 percent of houses in the city. About 27 people were confirmed dead in this city and more than a dozen others were reported missing, though most believe the final figure will far exceed that. Capahi, who lost his mother in the 1991 flash flood in this city that killed 4,000-6,000 people, said they took the typhoon warnings seriously but nothing could be done given the unprecedented strength of the storm. "We have experienced this before and certainly we can bounce back again," he added. But that will take time, with Mayor Edward Codilla saying it may take 3-4 months before any semblance of "normalcy" can be restored. "What we need right now is relief assistance for more than 100,000 people displaced by this typhoon [in Ormoc]," he said. 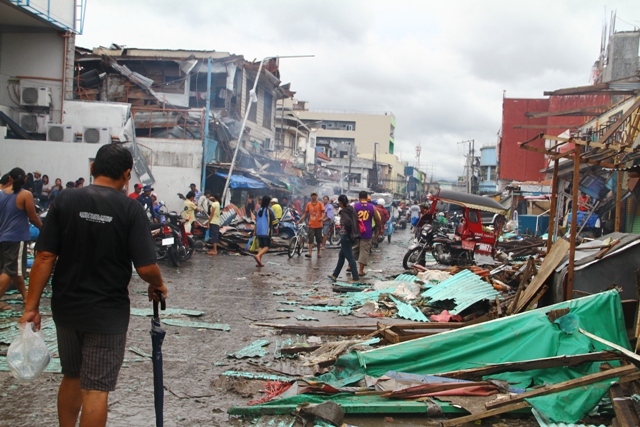 According to the National Disaster Risk Reduction and Management Council on 13 November, close to 600,000 are displaced. Of these 286,433 are living in some 1,000 evacuation centres, while 305,298 are staying with family and friends. Tracing separated family members will be a key component of the protection cluster - in particular tracing separated and unaccompanied children. However, according to Allison Lopez, a communications officer with the International Committee of the Red Cross (ICRC), there are several areas such as Samar Province that relief and even rescue efforts have yet to reach, something the government has confirmed. "The interior secretary (Mar Roxas) said Samar was also badly damaged, but the roads are simply not accessible as of now," Lopez said.